So I have my kids to thank for this adorable vinyl LP case, believe it or not. When I saw the $75 price tag, I didn't even want to haggle with the amateur estate saler who'd dreamed up that exorbitant figure. I never pay that much for anything except furniture, and how far down was she going to come if we were starting at $75? All the way to $25 it turned out, after the kids begged me to buy it, and it also turned out the case had been undervalued from the get-go because it contained a veritable time capsule of late ’70s/early ’80s kid music, almost all with nary a scratch or warp. If I were to sell off these records individually I would definitely recoup my investment and then some. But what kind of heel would break up such a fabulous collection, so lovingly curated by some kid who easily could've been me? Perish the thought. Let's just have a little Modern Library moment here, shall we? I mean, it's been a while. 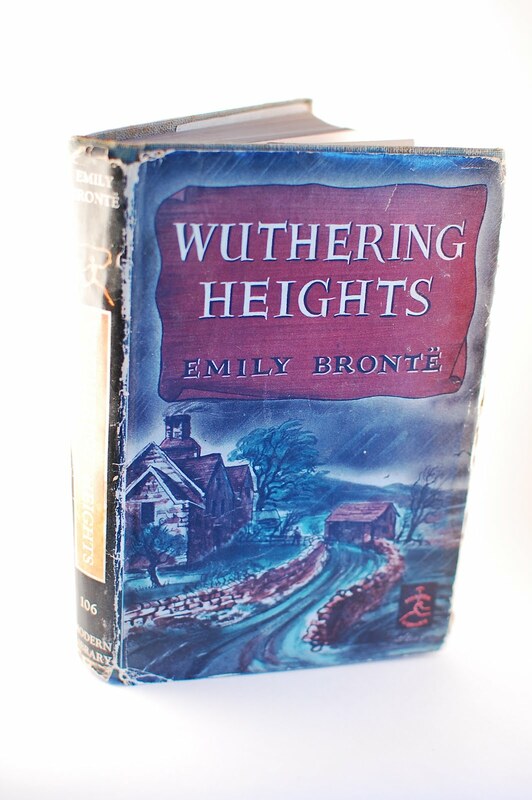 These are, in my humble opinion, three of the best books ever written: Wuthering Heights, The Portrait of a Lady and The Old Wives' Tale. 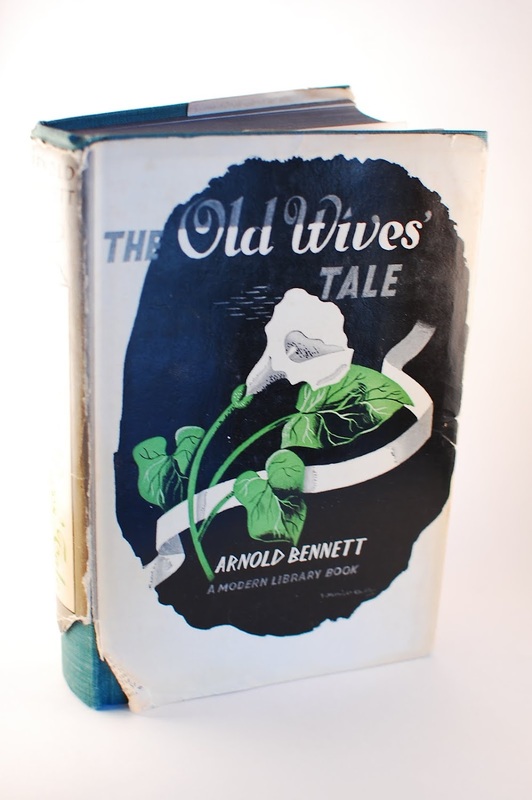 The last one, by Arnold Bennett, isn't nearly as well known as the other two. I mean, I'm a total English lit major dork and I'd never heard of it until I bought this copy at a library sale, simply because I'm striving toward a complete Modern Library collection. Turned out it wasn't just a lovely edition to look at (despite the slightly tattered dustjacket) but an amazing book to, you know, actually read. A naturalist novel, about the remarkable/unremarkable lives of a pair of sisters, spanning the mid-19th to early 20th centuries. You'll laugh, you'll cry, you'll mostly cry—just read it, okay? She looks like Wednesday from The Addams Family, right? I bought this sterling example of Outsider Art—okay, we'll just call it amateur art unless I decide to sell it on ebay—at a revelatory sale tucked into a stuck-in-time enclave within one of my favorite midcentury hoods. I had no idea that a nondescript street off of a busy road would suddenly turn to dirt and wind up a vegetation-choked hill, with just a scattering of 1920s-era ramshackle houses, one of which even had the remains of a show-jumping ring in the front yard. Paradise! I love finding off-the-grid places like this still exist amid the strip malls, fast-food joints and KB Homes. 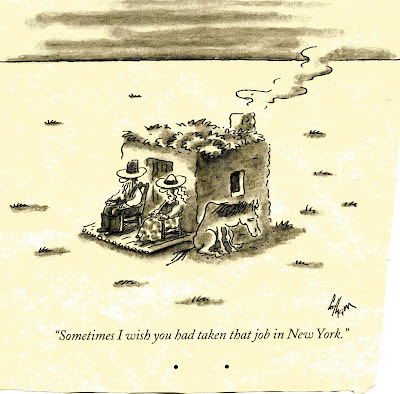 Not that I'm saying I'd want to live in this house, even though I dug its Chas Addams flavah, right down to the spectacular aviary—referred to as the "monkey cage"—in the middle of its multi-acre yard. Yikes—it was a total disaster. It didn't seem like the estate-sale company (a perfectly reputable one) even bothered trying to clean it up: it was jammed to the rafters and everything was coated with layers of dust/dirt/grime. Not for the squeamish estate saler. One of the former residents of the home was clearly a teacher (my favorite!) so I got piles of books and vintage teaching materials. (The cashier asked me the usual question: "Are you a teacher?" To which I gave my usual answer: "No, I'm just crazy.") On my way out, I found this painting teetering on a pile atop the piano. She's a cross between Wednesday and a Keene painting, though this is not a Keene painting—it's signed Robertson and dated 1963. Thinking I might sell it at my nonexistent antiques mall stall or etsy shoppe, I put it in the garage but then brought it out for Halloween display. Six months later, she still graces the picture rail in the dining room. Funny thing about those picture rails—the idea is that they give you the chance to rotate your art without putting holes in the wall. But I just end up finding new ways to squeeze another picture onto the rail without taking anything away. I'm certain that's a metaphor for something. 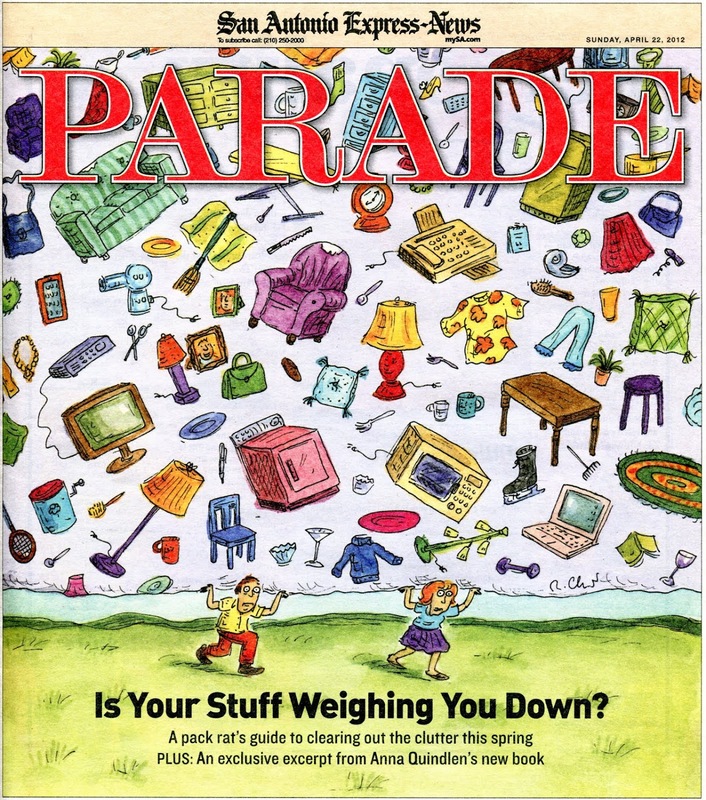 It's a pretty rare Sunday when I notice the Parade magazine in my local paper—engulfed as it is by Target ads, Toys R Us ads, Kohl's ads, the truncated Star magazine, the funnies—let alone read it. 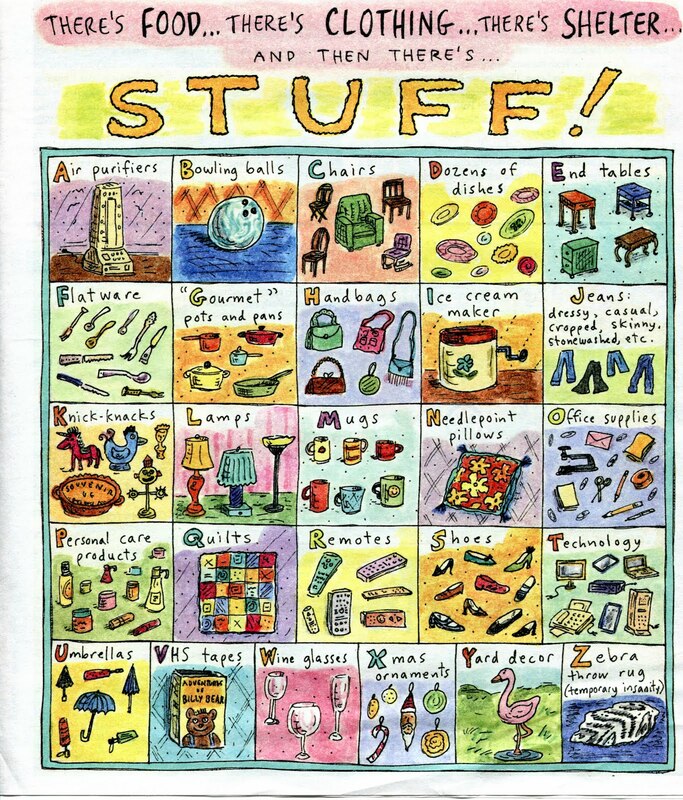 But, obviously, this Roz Chast cover spoke to me. The excerpt from Anna Quindlen's latest book of essays isn't anything too special, the usual late-life ruminations on the circle of stuff, the poignancy of objects, the importance of Christmas ornaments (um, nothing like this blog) but Roz's cover and inside comic are awesome. She is welcome to attach herself to Thingummery: The Nonexistent Book Proposal, if she ever wants to. Did you know Roz is also a crazy bird lady? This snippet from the NYT is great. I see a lot of shells at estate sales, and very often they're in the bathroom. Once upon a time, it was de rigueur to accessorize one's powder room with sea shells, usually by placing a bowl or basket of them on the counter, right next to the sink. I don't get that at all—I've got a pretty expansive bathroom countertop; nevertheless it's so crowded with mostly ineffective products and machinery that I wouldn't dream of trying to shoehorn some shells (or any tchotchkes) into the mix, unless my dermatologist told me that rubbing one's face with conchs is as good as Botox, but without all that Botox baggage. A lot of those bathroom shells seem to be the kind you buy prepackaged at a craft store or maybe a seaside tourist shop, not the kind that you dedicate a lifetime of vacations to collecting. Those kind of shells usually occupy a place of honor in the home—on the mantel, or in a basket on the coffee table. This particular basket of sand dollars, which my kids forced me to buy, is the latter type. I didn't want to buy them; for one thing, baskets bum me out. 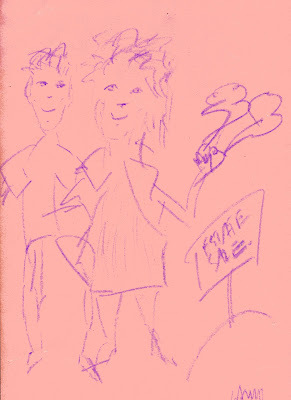 Judging by estate sale evidence, suburbanites have waaay too many of them. They're pernicious. They fill closets and garages. Cheap, sad baskets, the kind you buy at Michael's or Hobby Lobby, not the kind that could be exhibited at museums of Native American art (those kind of baskets, I do like). My crankiness about baskets is feeling a little fresh as I've just packed up Easter and shoved it into a closet that once seemed spacious. We've somehow managed to accumulate more Easter baskets this year. I have two kids with at least a dozen baskets between them. This is how it begins. My other issue with buying this basket of sand dollars is that there's something not right about buying an instant collection, when you consider the years of effort, of sharp-eyed beachcombing, it took to gather these perfect sand dollars. The quest, and the memories of the quest, is what shelling—and any kind of collecting—is about. I grew up vacationing on the Jersey shore, which is great for shelling but, as with any beach, there's a limited variety of shells you can find—it was mostly scallops, clams, oysters, mussels, jingle shells, and on a good day, moon snails and whelks. When I was a little kid, I was always searching for a conch or coral or a sand dollar, treasures that never washed up on our stretch of the Jersey shore (though we did find horseshoe crabs, dead sharks, and one terrible summer, medical waste and alleged animal sacrifices from Santeria rituals). I didn't find an actual sand dollar on a beach until I was in my early 30s and visiting friends in lovely Lynn, Massachusetts. I still have those sand dollars, in a cut-glass candy dish that belonged to Lindsay's grandmother, on a shelf in my office, alongside the exotic shells I found in Kaui on my honeymoon, volcanic rocks from Iceland and the Clovis artifacts discovered in my own backyard. Are they destined to be sold at my estate sale (many many many decades from now)? Despite all my misgivings, I didn't think twice about shelling out a couple of bucks for somebody else's shell collection. 'Twas a small price to pay to extend my stay at a really good estate sale. Plus, the kids have come up with all sorts of games involving the sand dollars. They even dyed a few of them along with their Easter eggs—and they're now stowed in the once-spacious closet, along with their inflatable rabbits, singing rabbits, vintage rabbits and one dozen Easter baskets. This weekend Lindsay is taking our younger daughter camping at the zoo. What a saint, right? It sounds like the opposite of fun to me—organized activities, no alcohol permitted and the hooting of the trains keeps you up all night. But he loves camping and between these zoo overnights and daddy-daughter camping weekends in various state parks, he's instilled a love of camping in our kids. So far I've managed to stay out of it, though I'm not sure how much longer I'll get away with it. All of my excuses—mommies aren't allowed to camp at the zoo!—have been contradicted by reality. Right now my stance is that I won't camp until we get a vintage Airstream or a teardrop trailer or anything that resembles the Barbie camper I had in my 70s youth (my kids have an identical one that I scored at an estate sale last summer). I love the vintage trappings of camping! Like these books—so cute. But actual camping? Do I have to? We have a small mug and cup problem at our house, and judging by what I see at garage sales, Goodwills and inside other people's kitchen cabinets, we are not alone. I try to keep ten or so in rotation; the rest are in the garage, taking up about as much space as a car would, if we were to ever actually attempt to park a car in our garage. Why don't I just get rid of the excess? Why do I even need 10 when only two coffee drinkers reside here? I use the same Tord Boontje-for-Target cups every day because I think they're pretty and they fit nicely under the spout of my Nespresso. I have three of them; one broke and two more are stored in the garage. Also in the garage: all the boring white Villeroy and Boch cups from my ill-chosen wedding china. Cups with corporate logos from Lindsay's old jobs, my old jobs, friends' old jobs. Novelty cups, joke cups and cups with photos of children emblazoned on them, ours and other people's. (Nothing sadder than seeing that particular genre of mug at an estate sale. Who buys a mug with someone else's kid on it?) We all need to agree to just say no to giving each other cups henceforth, unless they are very beautiful and made in Scandinavia. 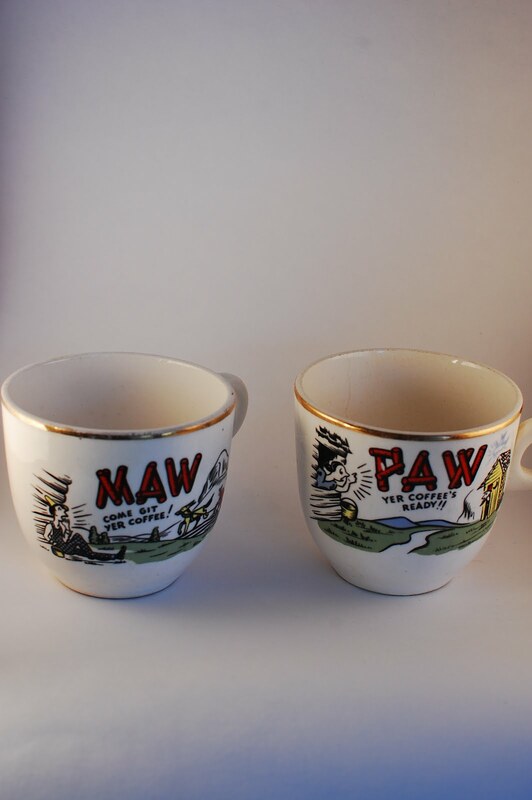 Before Tord Boontje did his Target thing (I don't think there was a better designer/Target collaboration), I regularly used this Maw cup, purchased, along with its Paw counterpart, at some estate sale shortly after I moved to Texas. The Snuffy Smith vibe spoke to me, fresh as I was from New Yawk City and carving out a new homestead—my little "country estate" in the exburbs. The problem with vintage cups (and glassware) is that you can't really put them in the dishwasher, and I'm not so country that I'm going to hand-wash my dishes if I don't have to. Plus, Lindsay started getting anxious about breaking his Paw cup, even though they're not valuable—you can easily score a pair on etsy for five or ten bucks. Quite replaceable, nevertheless they've been exiled to the china closet. At least they're not in the garage. In honor of tax day (not for us—we got an extension), let us celebrate this relic from a more innocent, bygone age, when advertising the precise location of your valuable documents seemed like a swell idea. When identity theft was something that only happened on soap operas, and was usually the result of an amnesia-causing accident orchestrated by an evil twin. When a PIN was something you just stuck in a cushion shaped like a tomato. Ahhh, those were the days, my friends, we thought they'd never end, until they did. A few weeks ago I mentioned my purchase of San Antonio's Most Famous Flamenco Dancer's vintage telephone and I know you were dying to see it, so here it is. Tres ’80s chic, no? At least I assume it's ’80s. I can't find another Soundesign phone like it on the internets so it must be very rare and very valuable, not that I have any plans to sell it when it looks so perky sitting atop a pile tech fossils in my garage. I've thought about using it but have you ever tried to use a restored/refurbished vintage telephone? They are, at best, unreliable and super-inconvenient. I have a beauteous orange Ericofon (midcentury Swedish telephone) on my nightside table, which works, intermittently, but is so damn inconvenient that when the phone rings I find myself sprinting to another room to pick up one of the ugly cordless phones we have scattered throughout the house. I'm not a big phone talker to begin with, so the idea of being tethered to my vintage phone, stranded in one small corner of my bedroom instead of being able to free-range from refrigerator to water cooler to computer to laundry room to patio and back again while on the phone sounds like hell. The only scenario in which I can envision myself contentedly yakking on the phone in bed is when I'm propped up on my pillows, wearing a satin bed jacket and popping bonbons—but that so rarely happens, you know? So the questions of the day are: Do aesthetically pleasing cordless phones exist? And why do I have a land line anyway? So yeah, today was the day we look forward to all year (well, one of the days): the massive annual used book sale thrown by the PTA of a neighboring school district. This crazy book party takes place in a huge gymnasium and every year I swear I am going to bring a cart, or a wagon, or a stroller, or some kind of wheeled vehicle to tote my book booty but what I end up doing is bringing four large tote bags (including one of those big blue ones you buy at Ikea—the one that could hold at least two small children and a bunch of swedish dishrags), thinking I'm not going to need to use them all, and then what happens? I end up filling all four ginormous bags before I've even worked my way down the first couple of rows and I have to drag them everywhere (because they don't have wheels!) and it's very painful and inconvenient for everyone. How I miss the rickety shopping carts that were sold on practically every street corner in Brooklyn! Here in Texas the concept of buying a shopping cart is difficult for most people to grasp: Why would you need one when you drive everywhere? Well, good point. You don't need one, except at this particular book sale, and one or two others I can think of. Well, I ended up going back on Sunday for the bag sale. I was skeptical at first because you had to buy their shopping bag for $15 ($10 for each additional). It didn't seem that cheap, right? But then when I started stuffing them with all kinds of scores, including a weird Christmas book by Richard Burton (and signed by him! ), I realized it was totally worth it and that those HEB totes hold a lot more than you would think. There's a couple copies of A Christmas Story over at Abebooks ranging from $400 to $500, not that I think there's much of a market for Christmas books by old-school Hollywood stars. Theoretically, I came out waaay ahead, and that's enough for me. I think I first learned about this Forgotten Bookmarks guy in Country Living magazine. Yes, I am a dinosaur who often gets her information from these things called magazines. Anyway, seems he's fellow dino, though a few key differences lie between us: He appears to sell his books for an honest living whereas I allow mine to pile up around me till I'm forced to devote a weekend to dividing them into neat new stacks, some of which are marked "to sell" and others "to give away," at which point they begin to gather fresh new dust, and remain unsold and ungiven, and are eventually engulfed by new piles, undivided, unorganized, un-neatened until I start the whole process all over again. No, this guy has an actual store and he also has a clear and simple idea behind his blog: sharing the cool and often poignant or odd things he finds inside old books. So it's no surprise he also landed a book deal. This blog wishes it were so straightforward. Like the name—thingummery—what does that even mean? Oh, whatever, I don't know. I do know that I too collect the bonus oddities I find sandwiched between the pages of old books and periodicals. I also wonder how they ended up there and I feel badly about separating them. Like my favorite, the stripper card in the sewing book, which I wrote about here. And here we have another example, though it's not quite as titillating. I bought this copy of Bananas magazine at one of those filthy, moldy, willies-giving sales that always have the best stuff and it's almost all too damaged to buy. HATE that. But I certainly couldn't resist a copy of Bananas with Willie Ames on the cover. Eight is Enough said, am I right? I'm such a prehistoric creature that I used to buy this ’70s-’80s pop culture magazine, the poor relation of Dynamite, at the Scholastic Bookmobile. As I was thumbing through the issue and trying not to get cooties (seriously, it looks like it spent the last decades languishing on someone's bathroom floor), this Polaroid portrait of a parakeet fell into my lap. As the owner of a pair of caged birds (zebra finches), I sympathize with the photographer, who probably just wanted a snap of his/her pet but ran up against a hard truth: Caged birds don't make good subjects. The pictures are all cage and very little bird. Anyhoo, parakeets kind of give me a bad feeling because I had one as a kid. My parents gave him to me for my birthday, though I don't recall ever asking for or wanting bird. I'm thinking they were just trying to make me stop pining for a pony. I remember going to the pet store and peering into this big glass tank set into the wall and it was just a blur of blue and green wings. I kept trying to point to the one I wanted and I'm pretty sure the pet store guy just gave me the first one he could catch. Maybe I held that against the bird because I named him Sinbad, after my favorite movie, and never paid him much attention after that. I thought he was kind of gross. I never let him out of his cage and I didn't make more than a half-hearted effort to teach him to talk. Eventually he moved into my brother's room and my brother totally loved him and let him fly around his room and sit on his shoulder and eat of his hand but he never learned how to talk, just uttered the two syllables of his name in a garbled bird language, and I was always blamed for that. When he died and was buried in a velvet box at the foot of the yard beneath the lilac bushes that are no longer there, was I even invited to the funeral? Oops, I seem to have gone off on another tangent. See what I mean? Not concise, not clear, this blog will never have its very own book deal. I don't really bother shopping for vintage clothes anymore—I'm too lazy to deal with the inevitable repairs, stain removals and alterations. I also find that, as I negotiate the shoals of my forties, I'm cleaving more and more to my standard jeans-and-white-buttondown-shirt uniform. But I do find it hard to resist cute vintage accessories because (a) size isn't an issue and (b) bedbugs are less likely to be an issue. Like, how could a bedbug set up camp in this awesome basket purse? According to my "research"—which consisted of reading descriptions written by etsy shop owners and vintage online boutiquers who may or may not know what they're talking about—this bamboo "birdcage" purse dates from the 1950s or ’60s or ’70s, and you could coordinate it with any outfit by lining it with a different scarf. I just thought it was pretty. I was tempted at first to let it collect dust, yet another impractical bag on the top shelf, but then I decided that would be a terrible waste of such an aesthetically pleasing conversation piece. I took it to one black-tie gala and found it rather difficult to balance drink/napkin/canape/bag and shake hands with sundry partygoers. When I left it on my chair, someone sat on it and I nearly fainted (remarkably it sustained no damage). And as with those clear plastic or lucite purses, you have to edit the contents pretty carefully. Drawbacks, to be sure, but this is a bag that wants to be seen—I'm waiting for just the right lawn party. Lindsay "scored" this Roberts Rally IV proto-Atari game console at a crazy ’70s sale—my friend Burgin, who hit it on the first day, breathlessly, rightly described it as "It's like your ’70s childhood exploded in this one house—you've got to go!" How could we not go? Lindsay gets a little glazed when surrounded by the totems of his childhood, so he was in heaven, despite the children whining and pulling on his clothes and asking for things. (Where was I? In the room with all the books of course.) Unfortunately, he made a classic estate-sale error: He saw something he liked: a working Atari, with games. He picked it up, examined it, then put it back down, undecided. Never put anything down! If you see something and kinda like it, hold it close till you've made up your mind. Officious estate sale workers might try to pry it from your hands—they'll offer to relieve you of your burden, to write up your ticket—but you just wave them away till you're sure. When Lindsay finally decided to get the Atari, he went back to the room and saw another guy with it tucked under his arm. ARGH. It's a terrible, empty feeling. Naturally he had to fill that void by buying something else, and the something else—the Roberts Rally IV pong game thingie—is still covered with dust and sitting in the garage. Apparently there's a small problem with the battery pack (there isn't one) but he's confident that he can make it work by crossing some wires, you know, when he gets around to it. And when he gets around to it, the kids will lay down their wii microphones long enough to play the four games built in to the system: hockey, tennis, squash and squash practice. Woo-hoo, squash practice! I was an English major in college. I like to read stories. And write about reading stories and sometimes write my own stories. Lindsay was a philosophy major. When we met, he was at the tail end of his senior year and I had one more to go. He was forever mumbling about some paper he was writing on the Marquis de Sade and something about Adorno and that funny math guy Leibniz and Rorty Rorty Rorty, the subject of his senior thesis. Who was this Rorty character and how could he be important if he was still alive? 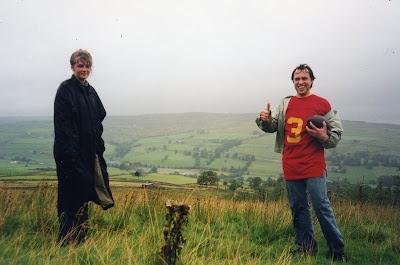 I was so self-involved with my D.H. Lawrence and my Chaucer that I never even bothered trying to understand what he was doing, just wishing that he'd hurry up and finish it so we could go sit on a roof and drink Carling Black Label and smoke cigarettes. As we've moved from apartment to apartment to house in NYC, and then to Texas, we've carted most of our college books along with us. I know a lot of former college students get rid of their college books but we are in harmony on this point so neither calls the other out on it: "Why do we still have the Penguin Classic Boethius and the Norton Critical everything?" he never asks me. "Why do we have Quine's Word and Object and Heidegger's Basic Writings?" I never ask him. We are in silent agreement. When we are in our 80s and finally go back to get those doctorates we always meant to get, we'll have our dog-eared volumes strewn with barely decipherable marginalia at the ready. We are not the only ones who cherish this dream. We went to an estate sale a while back that felt like a college bookstore going-out-of-business sale that happened to be held in a suburban tract house with a manicured square of lawn and a windmill out front. This guy had saved everything excellent, including lots of my beloved Modern Library books and vintage Signet paperbacks, and, surprise, surprise—Richard Rorty's Objectivity, Relativism and Truth. Lindsay snapped it up and tucked it under his arm. "Wait," I said. "You have that book." This I knew because I am the packer and unpacker of books. "No, I don't!" he said. "You're probably just mixing it up with Contingency Irony and Solidarity." I must've raised an eyebrow. "So what if I do have it? 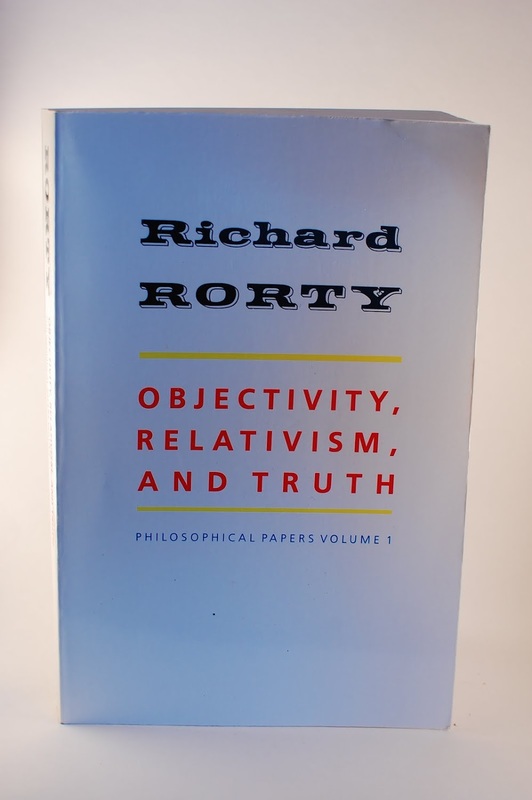 I'll send this copy to Jon" (a fellow philosophy major who went on to philosophy grad school and may well have his own copy of Objectivity, Relativism and Truth, though I think he was anti-Rorty, not that I know what that means). I looked at him like he was crazy and he went defensive: "I just want it, alright?" Okay, I let it go. It's not rational. I hesitate to use such a loaded term in this context, especially as an irrational former English major, but it's not. 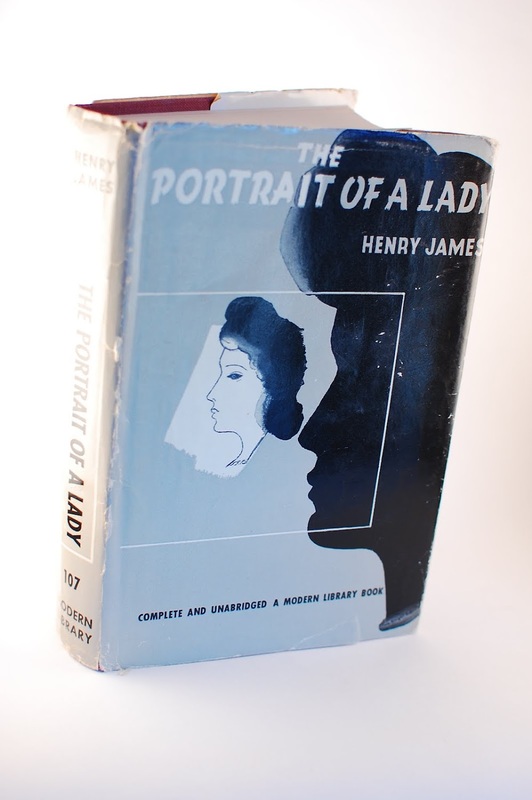 The book is not rare or out-of-print. It's not expensive, or leather-bound or autographed. It's a book he already has, but it represents a past life, a familiar face unexpectedly bobbing up in a crowd. It's a nice feeling, right? And crikey, for just 25¢ what's the harm? I scored these mint-conditon 1976 and 1977 Marvel comics calendars at a great sale in a great neighborhood. I remember there were flash-flood warnings that day but I braved the deluge because the sale was in a long, low brick ranch that I'd driven by millions of times—I had to see what treasure was lying behind its midcentury facade! My fortitude was rewarded: One room had nothing but boxes of pulpy paperbacks and comics, humor books of the ’60s and Mad magazines. That was one hour of glorious sifting. Sigh. Anyway, I knew at a glance that Lindsay must've had these calendars when he was a kid—10 or 11 years old and, I understand, an even bigger comic book geek than he is now. Whoever owned these calendar originally was a similar geek—they are perfect, not a mark on them, not a tear. No one crossed out the days or noted birthdays, god forbid. They were only a quarter apiece so naturally I bought them and when I presented them to Lindsay that evening (I couldn't wait till his birthday), he was, as expected, quite verklempt. He floated down memory lane for a spell, stroking the pristine pages, ogling the amazing artwork and eventually put the calendars on the side table at his end of the couch. Which is where they have remained ever since, in the pile of guitar magazines and cooking magazines. See, that's the conundrum. What do you do with a calendar once the year is over? Recycle it. Or, if you love it, tear it apart and frame the art? And mar the perfect integrity of the calendar? How could you even think of it, right?? He would never countenance that. We could sell these calendars to some other comic book geek for around 50 bucks a pop and let that guy slip it into an archival box or showcase and pull it out for fondling whenever the mood strikes. Right. That's sooo gonna happen. Today marks 23 years (12 of them legal) of bliss with my sometimes better, sometimes worser half. 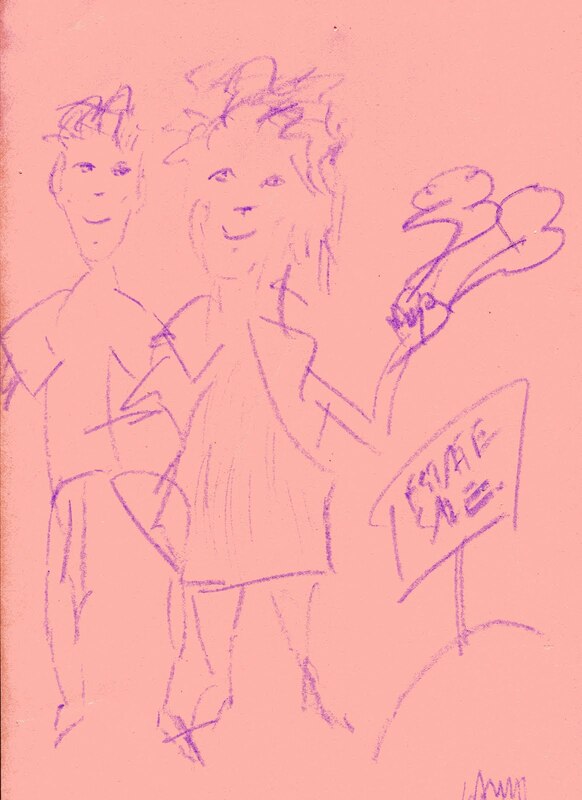 He left this little illustration on my desk a couple years ago—not sure why, he must've been in some kind of trouble, and what better way to make overtures of peace than to dash off an idealized portrait of us looking so jolly at an estate sale? With me brandishing...a head of broccoli? It's a pretty rare occasion that he looks so sunny at a sale, usually because he's wrangling the kids when he's not dramatically sighing about the massive quantities of books I'm buying. Whatever! Left to his own devices, like when I make him hit a sale in the vicinity of his downtown office, he's been known to get waaay carried away with the spending. Other times, he's struck gold, like when he scored a Paul Klee litho in some Kerville barn for $17 and it's supposedly worth thousands. I don't deny his eye—if only he could work on his attitude! But in his honor, this week I will highlight a few of Lindsay's finds/follies, as well as stuff I've bought for him at sales.